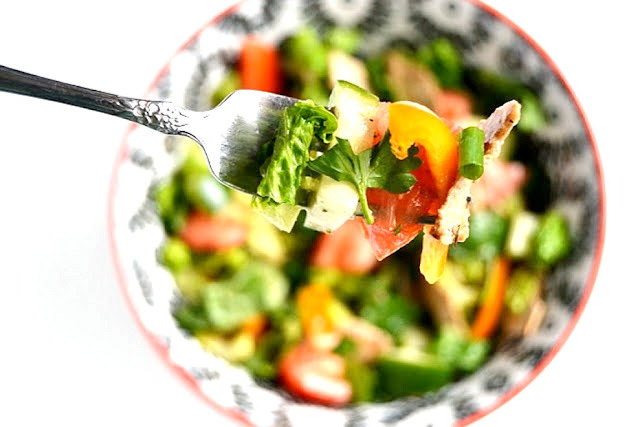 This Fattoush Salad recipe is a must try! An easy Middle Eastern chopped salad with loads of vegetables, a homemade lemon vinaigrette and toasted flatbread pieces. I absolutely love Mediterranean food. In fact, it is my favorite nationality of food and I could eat it daily. When I go to a restaurant and see fattoush salad on a menu, 9 times out 10, I am going to order it. Something about the mix of vegetables, toasted pita and tangy dressing is so delicious to me. A couple of weeks ago, my sister and I went out on a "sister date" and had dinner together. We ordered a fattoush salad and I had two thoughts: 1. This is delicious! 2. I want to recreate this at home. Luckily, I had all of the ingredients at home and made it for myself the very next day. It turned out awesome and I would definitely make this fattoush salad recipe again! To make it more filling, you can add chickpeas or grilled chicken. You could also add a sprinkle of feta cheese in if you like! 1. Preheat oven to 400 degrees. Brush flatbread with olive oil and sprinkle with garlic powder. Bake flatbread in oven until crisp. Take out and break into bite-sized pieces. 2. 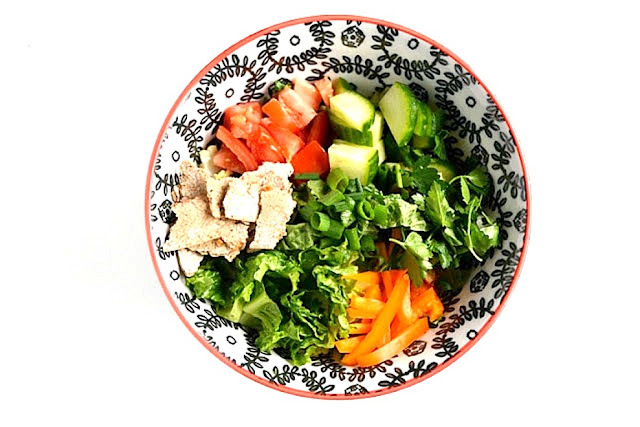 Mix together all vegetables for salad. 3. Whisk together all ingredients for dressing. 4. When ready to serve, toss together the flatbread chips with the salad and dressing. For this recipe, I used my favorite flatbread from Flatout. I chose to use the 100% whole-wheat flatbreads which are fiber and vitamin rich. I love this brand because they taste great, are full of nutrients and they are made in Michigan. We love making sandwiches and wraps for lunch packed with all kinds of nutritious foods. I like to use them in uncommon type recipes such as my Pizza Panzanella Salad. To find out where you can buy Flatout wraps, check out their store locator. Check out my Salads and Vegetables Pinterest board for more healthy and fun recipe ideas! Disclosure: This post is sponsored by Flatout. All opinions are my own. Thank you for supporting the brands that make The Nutritionist Reviews possible. 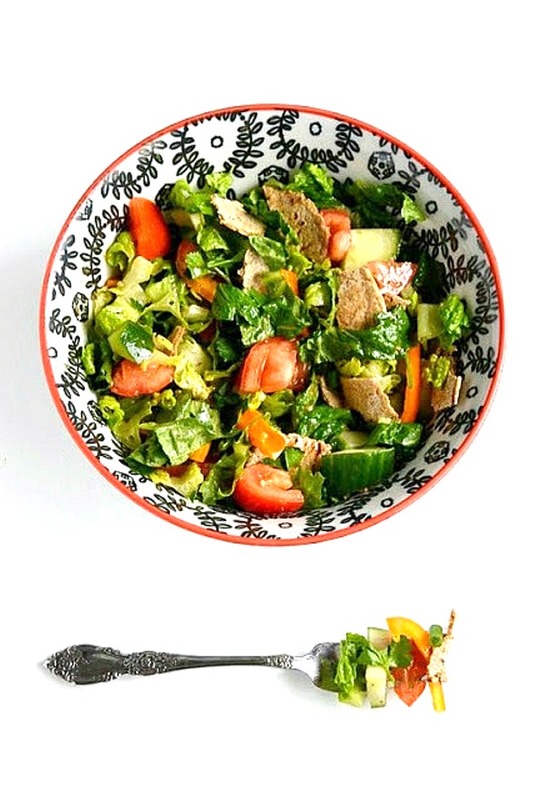 Love the salad and that bowl! Can you substitute another ingredient for the Sumac?